"Sometimes, it seems to me that nothing can excel a woodland pasture in the fall," wrote Lexington journalist and literary stylist J. Soule Smith in 1898. 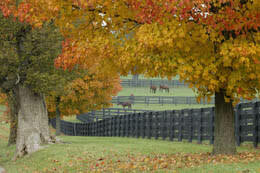 Nearly a century later, those who visit Lexington are likely to agree with him, for Kentucky&apos;s scenic Bluegrass area takes on a special beauty in the autumn months. Adding to the scenic enjoyment is the fact that there are all kinds of different ways to enjoy the spectacular view-the following are just a few suggestions. Drive our "blue (and gold, red and orange) highways." Fall is an ideal time to take the self-guided Bluegrass Country Driving Tour, available free from VisitLEX, the Lexington Convention and Visitors Bureau. The tour route winds past horse farms and through "hunt country" and is designed in three segments, so you can make a morning or afternoon -or a whole day- of it. (859-233-7299 or 800-845-3959). Bluegrass Note: You can find out about the progression of changing leaves across Kentucky, late September through early November, by calling the ColorFall Kentucky Hotline (800) 225-8747. Answer the call to the post. Nothing heralds the arrival of autumn to Lexington-area residents like an October afternoon of horse-racing and people-watching at Keeneland Race Course. So break out your tweeds and get ready to enjoy the cool fall air and a warm cup of "burgoo"- a special Bluegrass stew- at what many consider the most beautiful racetrack in the world. The 2018 fall racing dates are October 5 through 26, with racing Wednesdays through Sundays. Gates open at 11 a.m. and post time is 1:05 p.m. General admission: $5.00. (859-254-3412 or 800-456-3412). Travel the Kentucky River through picturesque Palisades. The limestone cliffs known as the "Palisades" were cut by the Kentucky River some five million years ago. Today, they serve as a dramatic backdrop for fall scenery along the river. An especially pleasant way to take in the view is aboard the Dixie Belle paddlewheeler, which gives hour-long excursions daily from the landing at Shaker Village of Pleasant Hill. The boat&apos;s season runs May through October. As the leaves reach their peak color, the waters of the Kentucky River turn a shade of teal creating an extravagant display of colors, textures and autumn aromas. Tickets are $10 for adults and $5 for ages 6 - 12 (ages 5 and under are free). They are available at Shaker Village. (859-734-5411 or toll free at 800-734-5611). Paddle along at your own pace. "Sweet silver Elkhorn, I hear thy music in my dreams," waxed a 19th-century poet about Elkhorn Creek. Take an excursion along this historic, beautiful and beloved Bluegrass stream and you, like the poet, may just be enchanted by its sparkling water and the view it offers of horse farms, historic sites, great picnic spots and plenty of fall color. The Elkhorn wanders through several counties. You can set a canoe at several spots along the creek: Oser Landing Park on US 460 near the I-75 exit; Great Crossings Park off US 227; or Cardome Park on US 25 N, north of downtown Georgetown. Excursions at these sites can be arranged by calling Canoe Kentucky at (502) 227-4492. From out-of-state call (888) CANOEKY or visit www.canoeky.com on the internet. Back roads in the Lexington area are ideal for scenic bicycling. Ride under the canopy of trees along Old Frankfort Pike, an official "Scenic Byway" or Pisgah Pike, past "the castle," historic Pisgah Church and lovely horse farms. The new Legacy Trail, a beautifully landscaped 12 mile interpretive trail is another option. 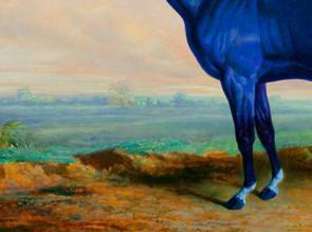 It runs from the Isaac Murphy Memorial Art Garden downtown to Kentucky Horse Park. About eight miles of the trail are off street and fully paved. For information about regular organized rides and other recommended routes, ask at area bike shops like Bicycle Face (859) 888-2453 or Pedal Power (859) 255-6408. Check out the Bluegrass Cycling Club website as well: www.bgcycling.org. The club&apos;s annual Red River Rally in the Red River Gorge area of Daniel Boone National Forest has been a favorite ride with local cyclists for over thirty years and is held in early October. Raven Run Nature Sanctuary is 734 acres of unspoiled natural scenery just minutes from downtown Lexington. In fall, the sanctuary is a wonderful place to admire meadow wildflowers, catch sight of many varieties of birds passing through on their way south, and to explore the Kentucky River Palisades area. You can just drop by to wander its ten miles of trails on your own, or call ahead to register for special programs ranging from Tree Walks to history hikes.There is no admission charge to enter the park. The sanctuary is at 3885 Raven Run Way in Fayette County, and is open daily. (859) 272-6105. Discover tree-mendous getaways in the city. Actually, you don&apos;t even have to leave the city to enjoy fabulous fall scenery. Lexington Cemetery, 833 West Main Street, includes more than 200 varieties of trees, along with lovely ponds, other plantings and an array of fascinating monuments. The cemetery is nationally recognized as an arboretum. A tree guide is available at the cemetery. Gates open at 8 a.m. and close at 5 p.m. Admission is free. (859) 255-5522. Large trees, interesting fountains, sculptures and historic homes in the Gratz Park neighborhood (bounded by Third, North Mill, Market and Second streets) make it a pleasant autumn promenade; the Lexington Walk map, available free at the Lexington Visitors Center, offers a descriptive tour. (859) 233-7299 or (800) 845-3959. Fall also is a beautiful time to stroll the grounds of Ashland, the Henry Clay Estate. The hundreds of trees on the 20-acre setting include gingko, maple, beech, bur oak, a huge American elm and, of course, blue ash, for which the estate was named. There&apos;s no charge to tour the grounds. (859) 266-8581. Bluegrass Note: About 12 million acres-representing about 47 percent of the state&apos;s land area-are forested in Kentucky. About 175 species of native and introduced trees grow wild in the state. The official state tree is the tulip poplar. The Kentucky coffeetree, the only tree to mention Kentucky in its name, is the official state heritage tree. The whole family will enjoy a visit "down on the farm" to find the perfect pumpkin, along with fresh apples, Indian corn, gourds and other fall bounty. Eckert&apos;s Boyd Orchard in Versailles is famous for its apple cider and pumpkins. (859) 873-3097. At Bi-Water Farm & Greenhouse, tackle a five-acre corn maze, hop on a hayride, walk through the haunted farm house, visit the Enchanted Barnyard or take a train ride around the farm. (502) 863-3676. Evans Orchard always has fabulous family fun in the fall, which sometimes involves a pumpkin throwing contest. (502) 863-2255. Take a gorge-eous train ride. Bluegrass Scenic Railroad lives up to its name more than ever with its fall excursions into the Kentucky River gorge area. The 90-minute train rides are offered on Saturdays and Sundays through late October and depart from Woodford County Park, off US 62 (Tyrone Road) and Beasley Drive in Versailles. They also offer special Halloween and holiday excursions. Tickets for regular excursions are $12 adults, $11 ages 62 and over, $10 ages 2 to 12. Check out their museum before you board. (859) 873-2476. Advanced riders will enjoy Big Red Stables in Harrodsburg, where both unguided and guided rides are available. Prices start at $40 per hour and reservations must be made in advance. (502) 863-5701. At Whispering Woods, 265 Wright Lane in Georgetown, your riding adventure can include camping and picnicking as well as trail rides and pony rides. There are special haunted trails to hike in October. Prices start at $30 for the first hour, and. if you won&apos;t get too saddle sore, $50 for ninety minutes. (502) 570-9663. At Deer Run Stables, 2001 River Circle Drive in Richmond, guided one hour trail rides are $30 per person. (615) 268-9960. Catch fall scenery - and maybe more. There are numerous marinas at 3,600-acre Lake Herrington, located off Ky. 152 between Harrodsburg and Danville. (800) 355-9192. A state fishing license, available from most local convenience stores, sporting goods stores and bait shops, is required. 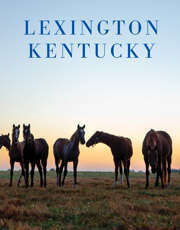 For more information, call VisitLEX, the Lexington Convention and Visitors Bureau, at (800) 845-3959.